The spring season brings many exciting events, including warmer weather, baseball, grilling season, and for those of us lucky enough, a nice tax refund check. If you are expecting a tax refund, you’ve probably thought hard about what to do with that money. You could put it in the bank for a rainy day or put it to work for you through an investment. While these strategies offer potential for the future, there is another option that offers benefits for the future AND today—investing your tax refund into a new wood pellet grill. 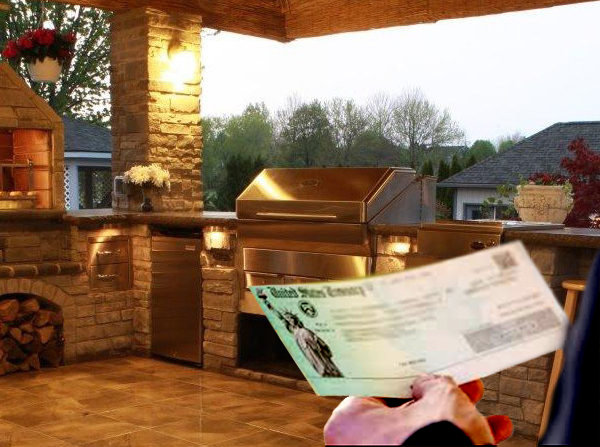 If you have a dream of creating a built-in grilling space and fully functional outdoor kitchen, but don’t currently have the time or money, Memphis Grills has you covered. Don’t wait to buy your wood fire grill; the time is now to begin transforming your backyard into an outdoor cooking space. Our cart models offer the full wood pellet experience and can be converted to a built-in grill with our slide-in kit. The kit includes all the necessary brackets, hardware and components you need to easily incorporate your cart-style grill into the outdoor kitchen of your dreams. Slide-in kits are available for both Memphis Pro and Memphis Elite cart models. Keep working towards your future outdoor kitchen oasis while grilling on your wood pellet grill today. Outdoor enjoyment: Warmer weather brings outdoor activities, including grilling, parties and more. A new wood pellet grill can improve the enjoyment of your outdoor space and limit the time you spend inside in the kitchen. Better entertaining: Grill, smoke, bake and roast—all on a single grill. That’s what’s possible with a Memphis. And, with the intelligent temperature controls of our grills, you can spend less time focusing on the food and more time entertaining your family or guests. We won’t say that a new wood pellet grill will make your family and friends like you more, but it certainly can’t hurt, can it? Future-proof grilling: If you have a dream of creating a built-in grilling space and fully functional outdoor kitchen, but don’t currently have the time or money, Memphis Grills is here for you. Our cart models offer the full wood pellet experience. You can easily convert them to a built-in grill with our slide-in kit. Get your hands on one of our ultimate wood pellet grills today and you can continue to work toward your future outdoor kitchen oasis. Peace of mind: It isn’t often that an investment comes with a warranty—with Memphis, it does. We offer a generous warranty plan to keep you grilling for years to come. We can do that because we construct our grills using 304 and 430 stainless steel and the highest quality electronic components available. Memphis Grills are built to keep you cooking through any weather condition. Flavor, flavor, flavor: Grilling with 100 percent natural hardwood pellets adds unparalleled flavor to your foods. Mix and match our six varieties of natural, compressed wood pellets to create flavor profiles you won’t find on a regular gas or charcoal grill. At Memphis Grills, we truly believe that there is no better way to enjoy a relaxing evening or weekend than grilling your favorite meal on a wood pellet grill. We aren’t alone in that belief—read about the experiences of many of our satisfied grillers, or peruse our full line of grills and accessories to see which best fits your lifestyle and grilling needs.